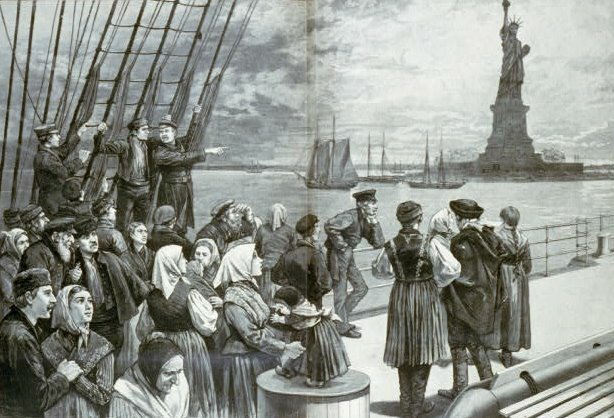 When searching for your ancestor’s immigration record the key year to remember is 1906. Prior to 1906 the information contained on a naturalization document was limited to the country of origin and perhaps the date of arrival. Not much else. Post 1906 you will find much greater detail – and perhaps even a photo. You may find not only the date of arrival and country of origin, but also the departure port, the birthplace, and birthdate. Below is a sample Declaration of Intention filed by Albert Hendriks Adema in the Circuit Court of Kent County, Michigan. This is a post-1906 declaration. Notice the amazing detail that is given. We know that Albert was a farmer. There is even a physical description of his person. We know he was born in the Dutch Province of Friesland on 18 April 1876. 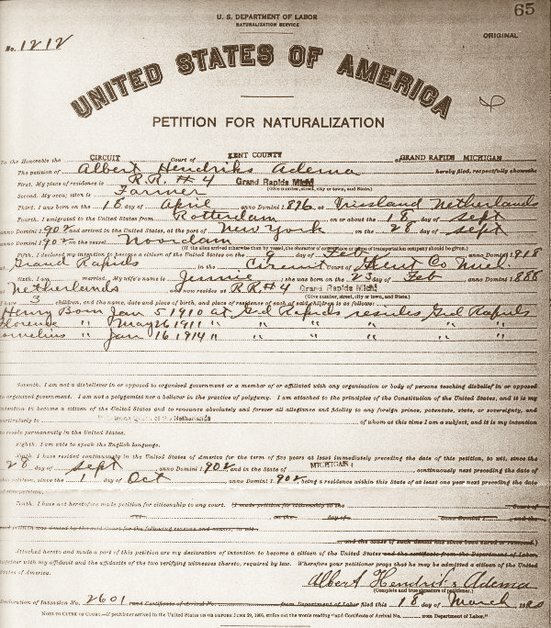 The document also reveals that Albert immigrated on the 28th day of September 1902 aboard the Noordam from Rotterdam, Netherlands to New York City. The amount of genealogical information on this one document is plentiful. Now take a look at Albert Adema’s second papers – his Petition for Naturalization. Even more detail is found. Dates of departure from the Netherlands and arrival in America. His wife’s name and birthdate and birthplace are given along with the names of his children complete with birth-dates and birth-places. This is the amount of information you can expect to find on any and all ancestors that filed after 1906. 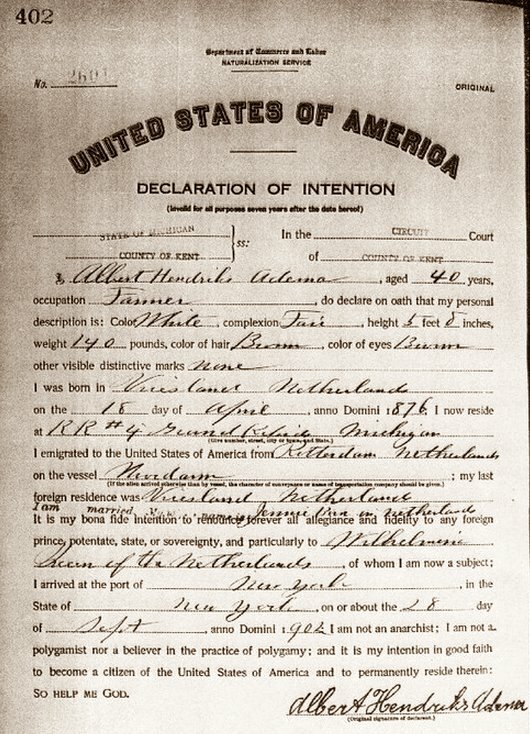 Though Albert arrived in 1902 he did not file his Petition until 1920.
from 1906 to 1990 all courts in every State had to forward copies of Naturalizations to the INS. Alien wives had derivative citizenship meaning that they automatically assumed the alien or citizenship status of their lawful husbands. Thus if a woman had citizenship under her husband, he dies and she remarries an alien, she then once again became an alien – she lost her citizenship by marriage. Not quite a fair system but that’s how things were. In our example above with Albert Adema and his wife. Because Albert was naturalized in 1920 his wife and children automatically were granted citizenship. However, let’s assume that Albert died a year later in 1921 and wife Jennie decides to remarry a new alien immigrant arrival that she falls head over heels in love with. Because this man is not naturalized Jennie automatically forfeits her citizenship status because her citizenship is dependent upon the male. In 1922 women could obtain citizenship on their own standing. It was no longer by marriage. Thus a woman who became a naturalized citizen (post-1922) who then marries an alien does not lost her citizenship. Immigrations for some counties filed in County Circuit Courts are indexed on SeekingMichigan.org. 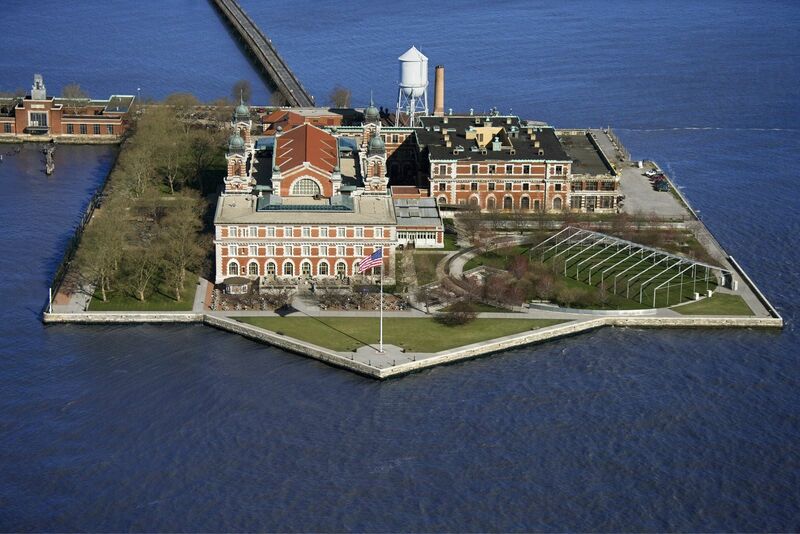 Prior to 1906 naturalizations could have been filed at city, county, state or federal levels. So it might be more difficult to find where this event took place. And first papers weren’t necessarily filed in the same location as the second papers. Many aliens right off the boat applied for naturalization right in New York. Then later after the appropriate waiting period they would file their Petition from within whatever state they then resided. Remember too that Naturalization was NOT a requirement. If you can’t find a Naturalization record for your ancestor perhaps he chose not to file. Naturally his descendants (born here) would be citizens. But there was no mandate that said an alien had to be naturalized. If you are looking for a Naturalization record for your immigrating ancestor follow the places your ancestor passed through. Start with the port of arrival and whatever cities he may have lived in up to his final location. Look for clues. The 1900 Federal census lists the probable year of your ancestor’s immigration though I have found this to be in error on at least two occasions.